This is an ancient Scandinavian Viking silver penannular arm-ring, dating to the 9th - 11th century A.D. The ring is formed from rods twisted together, the terminals hammered. This ring is further decorated with thin twisted wires, set into the spiral grooves. 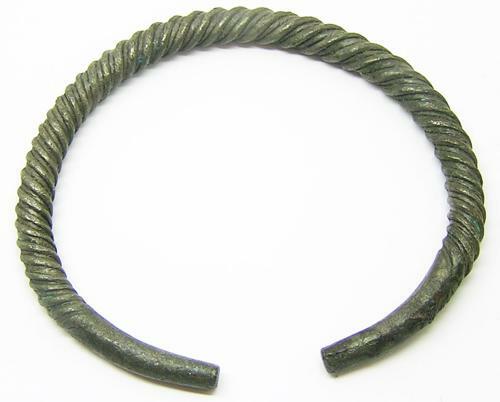 This type of arm-ring and bracelets seem to have been popular throughout Scandinavian Iron-Age, being found in treasure hoards, being used as a form of payment/wealth (for the weight of the silver) in a bullion economy. This example is in excellent condition, intact and uncleaned, with the original dark patina from the excavation. Today this piece can still be worn! DATE: c. 9th - 11th century A.D.